The moon completely blocks the sun over Australia on Nov. 13, 2012 (EST). This story was updated at 4:05 p.m. EST. 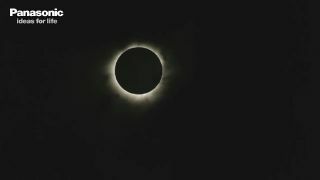 The last total solar eclipse until 2015 has begun, with the moon's shadow commencing its three-hour trek across Earth's surface in far northern Australia. The total solar eclipse began at 3:35 p.m. EST (2035 GMT) today — shortly after dawn Wednesday (Nov. 14) local time in Australia — over the Northern Territory's Arnhem Land region. The moon's shadow swept southeast from there, crossing the Gulf of Carpentaria into the state of Queensland before heading out into the vast Pacific Ocean, where few will see it. Despite some clouds, the eclipse was clearly visible to observers in Cairns, on Queensland's northeast coast. More than 50,000 spectactors, along with teams of scientists, flocked to the tropical city and saw the moon cover the sun's disk completely for two minutes, beginning at 3:39 p.m. EST (2039 GMT). If you're not among the lucky few along the path of totality, you can still watch the eclipse online. Several organizations, including the Slooh Space Camera and Tourism Tropical North Queensland, are webcasting live views from Cairns. You can watch several live webcasts of the solar eclipse at SPACE.com. The total eclipse comes to an end at 6:48 p.m. EST (2348 GMT) today, with the moon's shadow petering out 610 miles (980 kilometers) west-northwest of Santiago, Chile — about 9,000 miles (14,500 kilometers) from its starting point Down Under. A view of the partially eclipsed sun from the Slooh Space Camera's feed based in Port Douglas, just north of Cairns, in Northern Australia on Nov. 13, 2012. The last total solar eclipse took place in July 2010, and the next one won't occur until March 2015. However, a so-called "hybrid" eclipse — which shifts between total and annular at different points on the globe — will come to parts of the Atlantic and central Africa in November 2013. Today's eclipse isn't just a boon for skywatchers. Scientists view it as a rare chance to study the sun's thin outer atmosphere while the solar disk is obscured. Amateurs and professionals alike are in for an unforgettable experience today, experts say. "On a scale of 1 to 10, total eclipses are a million," NASA researcher Fred Espenak said in a statement. Warning: If you are watching the total solar eclipse in person, be extremely careful. Never look directly at the sun, either with the naked eye or through telescopes or binoculars without the proper filters. To safely view solar eclipses, you can purchase special solar filters or No. 14 welder's glass to wear over your eyes. Standard sunglasses will NOT provide sufficient protection. The eclipse isn't the only celestial treat skywatchers can look forward to this week. The annual Leonid meteor shower, which has produced some spectacular shows over the years, peaks overnight Saturday (Nov. 17). "First contact, woo hoo!" call the crowds from Australia as the moon first starts to obscure the corner of the sun during a total solar eclipse Nov. 13, 2012. Editor's note: If you are along the eclipse path in Australia or elsewhere and snap an amazing photo of Tuesday's total solar eclipse that you'd like to share for a possible story or image gallery, please send images, comments and location information to managing editor Tariq Malik at tmalik@space.com.